On my first pass through the magazine, I was pretty certain I’d be giving you an adaptation of Bon Appetit’s Blackberry Buttermilk Cake this month. In fact, looking back at the photos of it now has me borderline pining. But here’s the deal: I just made over their olive oil cake, and worked on that angel food cake, and—spoiler alert—next week I’ll be giving you yet another cake. Now, I love me some cake. It’s is probably my favorite type of dessert. After three cakes in a matter of a few weeks, though? I was beginning to feel a little caked out. 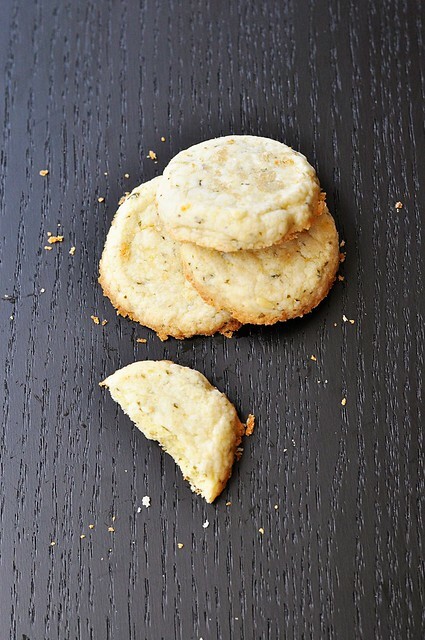 After another look at the July issue, I spied these Lemon-Lime Basil Shortbread Cookies. And you know what I don’t have a single recipe for on this site? Cookies. I’m not totally sure how that’s possible. I make cookies. I have recipes for cookies. I guess I just make a lot more cake…. So I could use a cookie recipe here and these guys sounded intriguing. Not to mention, my basil is as prolific as ever. A few leaves on top of pizza here and a chiffonade into a light tomato sauce there hasn’t really been keeping it at bay. I know I’ll need to start considering pesto soon, but these funky little treats have helped out nicely. Biting into one of these is an odd experience. 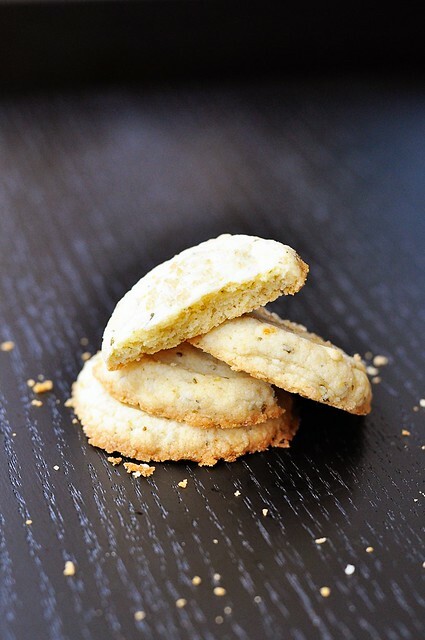 First your tongue is thwacked with the distinct tartness of lemon, after which the flavor dissolves into lime and fades into herby, almost unidentifiable but definitely present, basil–and all wrapped up in the buttery flakiness of shortbread. This cookie walks a strange line between sweet and savory. At first bite, you almost think it doesn’t work…until all of a sudden it does. 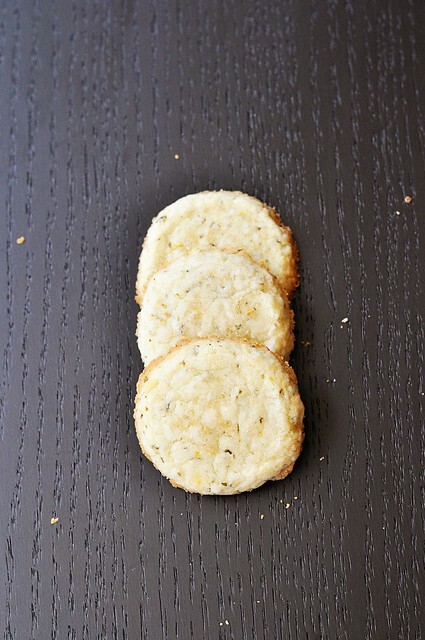 One of the best things about these cookies, however, is the potential they have beyond the lemon-lime-basil combination. I could see using only lime and replacing the basil with mint for a mojito-esque mixup. I’m also willing to bet that you could produce an effective vegan variation by subbing chilled coconut oil for the butter 1:1. 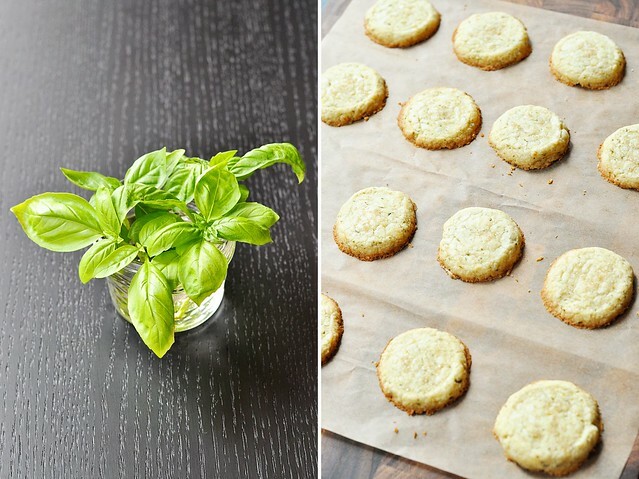 And the coconut oil would go extremely well with mint and lime (Cocojito shortbread, anyone?). You could also try lavender-lemon, rosemary-orange, lemon-thyme…. So these weren’t a magnificent blackberry upside-down cake. Instead, this recipe produced a tender little shortbread cookie and a template for endless experimentation. And did I mention that they come together in about five minutes with a little help from the food processor? Fast, easy, and delicious. I might just need to start having afternoon tea. Preheat the oven to 375 degrees. Line a baking sheet with a silicone baking mat or parchment paper. Add the millet and brown rice flours, the potato starch, xanthan gum, powdered sugar, and salt to the bowl of a food processor. Pulse until the ingredients are evenly combined. Toss in the basil, the lemon and lime zest, lemon juice, and butter. Pulse several times, until the dough just begins to form a ball. Measure out level tablespoonfuls of dough. Roll into balls and place 2 inches apart on the prepared baking sheet. Dust the bottom of a measuring cup with powdered sugar and use it to gently flatten out the balls of dough to just shy of 1/2-inch thick; continue to dust the measuring cup with powdered sugar as needed to keep it from sticking. Place dough in the refrigerator to chill for at least 30 minutes. Sprinkle unbaked cookies with coarse sugar, if using, and bake for 12-15 minutes, until the edges are golden brown. Transfer to a wire rack to cool. Disclaimer: This is part of a series of posts I’m doing to remind me to read my mounting food magazines. Bon Appetit may be vaguely aware that I am adapting their recipes, however, these adaptations are solely for my own gastronomical benefit and yours.